Sometimes WordPress outputs a strange error message called “Cannot modify header information – headers already sent”. Your blog crashes, and displays nothing other than the error message. How do we fix this? While the exact cause can vary, the underlying problem is the same. Let’s say you’re trying to redirect the request to some other page, like here for example, where you’re trying to hide your author information by switching to the home page. The above error will show up if you try and output something before the redirect takes place. Essentially, you’ve already started the page loading process in the browser either by sending the headers or some output, and can’t go back. You can see the “printf” statement coming before the “wp-redirect” function. Since printf already sends some output to the browser, it’s too late to create a redirect now. Removing debugging statements before changing headers or printing stuff to the screen (or even the browser console) will remove the “headers already sent” message. Of course, you won’t normally code like this from scratch. But it can easily occur if you’re copying and pasting code from sources that enclose their code in PHP tags. 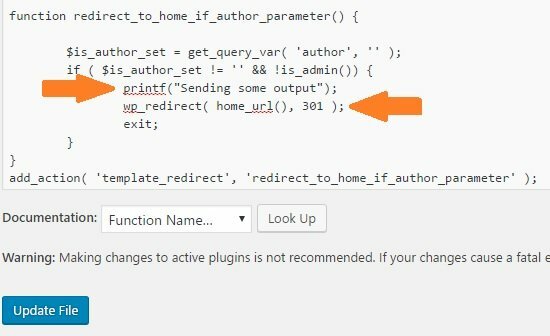 If you try and change WordPress headers or redirect after this “gap”, you’ll get the “headers already sent” message. “BOM” stands for “Byte order mark”, and is a sequence of characters at the start of the file to indicate that it’s encoded in UTF-8. The Linux environment of PHP doesn’t recognize this character and treats it as text. Meaning that it’s sent as an output to the browser. Oops! You’ll most often encounter the “BOM” problem when attempting to set cookies. You’ll get an error message like this: “Cannot send session cookie – headers already sent”. If this is the case, check the encoding you’re using for your PHP files. Remove the “BOM” in your UTF-8 files and you’re golden. Hopefully, this article will help you troubleshoot your error and fix your code. Good luck!